By Norman Chan on Aug. 20, 2014 at 2:45 p.m.
Two tablets that make good use of an accessory you'll never see bundled with an iPad. 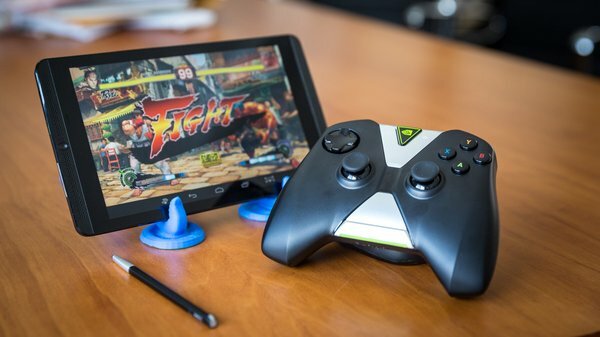 Two things struck me while testing the Microsoft Surface Pro 3 and Nvidia's Shield Tablet, devices I ended up really liking. Both are ostensibly tablets, but the way I used each of them differed from how I used my iPad Mini. First, I rarely used held either of them like a notepad, with one or two hands gripping the sides. Most of the time, I had the Surface propped up in its "canvas" position using its kickstand on a flat surface, and kept the Shield Tablet propped up on a small makeshift kickstand as well. They were tabletop computers, not handheld ones. Second, I was surprised by how much I enjoyed using the stylus on each of these devices, and not necessarily as writing instruments. 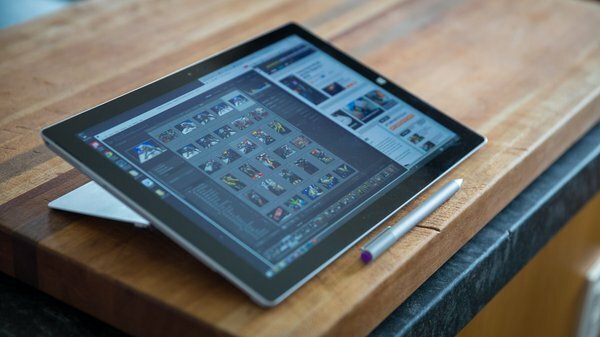 For both the Surface and the Shield Tablet, the stylus actually became a second navigational tool, used to swipe through the home screen and browse the web. These use cases became as intuitive as touch pointing and gestures--still the primary physical for iPads. And it made me think about how much Apple is limiting the potential of its iPads by staunchly sticking to touch. Let's start with the Surface Pro 3, which has an active stylus. As I said in our video, my limited digital drawing abilities don't allow me to discern the difference between the Wacom-based digitizer used in the last Surface Pro and the N-Trig one used here. What matters to me isn't degrees of pressure sensitivity, it's accuracy and latency. 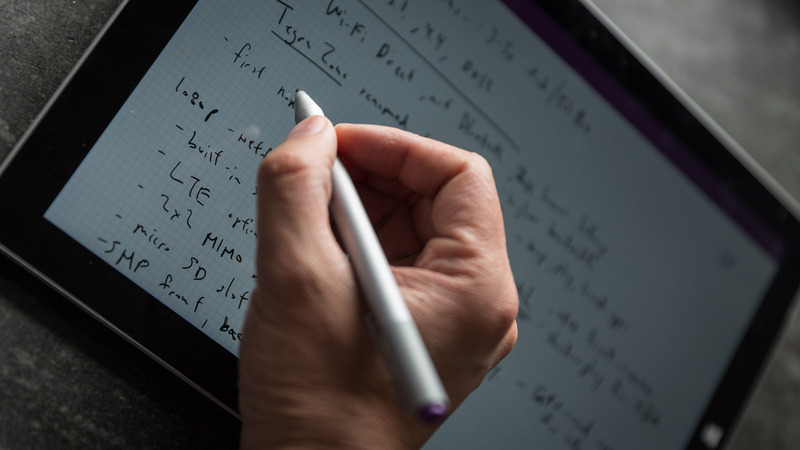 And the Surface Pro 3's stylus was completely sufficient for note-taking in OneNote--my chicken scratch handwriting looked on-screen like they would have on paper. The ability to manipulate those scribbles as vectors and use the stylus to crop/copy/paste images with annotations made those notes more useful than the ones in my paper notebook after having made my jots. But my favorite way to use the Surface Pro 3's stylus was actually as an extension of my fingers on the touchscreen. On the Windows desktop, the stylus became a proxy for my mouse cursor. Even with Windows' improved touch tracking for tapping small buttons, the one thing that touch can't facilitate is a cursor hover. With the active stylus, I could hover the tip over the screen and see where the cursor is before making a pinpointed tap. Even when I had I mouse connected to the Surface, I would use the Stylus in combination with my fingers to browse the web--tapping Chrome's UI and scrolling with the pen and easily still pinching to zoom on pages with my fingers. That complementary use of fingers and stylus felt completely natural. Much like how I've found touchscreens to be a delightful complement to the primary keyboard and mouse interface on a laptop, I've found the stylus to be an intuitive complementary input method to finger touch on tablets. You can have the cake and eat it too. The only thing I wish is that Microsoft could have found a better way to store the stylus to the Surface Pro 3. In past versions of the Surface Pro, the stylus stuck magnetically to the side of the device, attached to its charging port, actually. It wasn't particularly secure, and meant that you had to remove the stylus to charge the Surface. On the Surface Pro 3, the stylus has no docking port--only a sleeve on the type keyboard accessory to slip into. I realize that given the thickness of the stylus and the densely packed design of the tablet's guts, there's no space for a recessed stylus dock. It's the problem that Steve Jobs bemoaned when mandating a touch-only interface on the iPad, but not an impossible task. Lenovo's ThinkPad 2, for example, is a hybrid device with a built-in stylus dock. On Nvidia's Shield Tablet, the stylus worked for me again as a great input tool for UI navigation, especially since I propped the Shield up on a kickstand instead of using it in my hands. The Shield Tablet ended up being used more like a small desktop monitor than an iPad. It's a monitor with a game console and set-top box built-in, and so my primary method of controlling it was with the Wireless Controller accessory (which has a small touchpad) and the stylus when I needed to make precision taps. That didn't preclude me using it as a traditional tablet for surfing the web, writing email, and running apps when on the go, but like the Surface Pro 3, I found the Shield Tablet's greatest strengths were in its un-tablet-like abilities. The Surface Pro 3 is a great laptop first, OK tablet second. The Shield Tablet is a great streaming (video+games) box first, OK tablet second. Their dual roles don't come at the expense of dealbreaking compromises. That's an approach we're unlikely to see from Apple, even though it is beginning to open up its SDK to third-party accessories like Adobe's Ink and Slide and gamepads. The touch-first emphasis of iOS has kept iPad ahead as the best pure tablet experience, but the touch-only tablet category is shrinking as competitors continue to experiment and innovate--successfully.